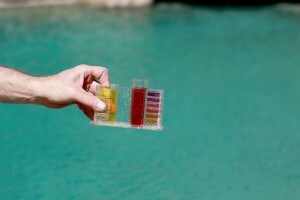 Keeping your pool chemicals in proper balance is essential to have an enjoyable swimming experience. Most pool professionals will balance your pool or spas chemistry to somewhere between PH7.2 – 7.6 as the human eyeball typically has a PH of 7.4 and this is the part of the human body usually most sensitive to chemicals and PH. Chemical Service is recommended for the person who likes to service their own pool themselves, but doesn’t want to bother with chemicals. Chlorine balancing the water chemistry are included with the regular service. Filter cleaning is essential to keeping your pool looking beautiful. It is recommended to have your filter cleaned about once every 9 months in most cases. We will clean your filter only when needed as determined by your pool tech. Algacide is added to your pool between February and October. We begin using an algaecide early in the year as a preventive measure. Our thinking is; prevent algae before it begins growing. We have found great success with this method and the added benefit is, less chlorine is needed to keep your pool clean and clear. The cost for the summer algae treatment is $60 and is billed in October. Conditioner is an acid, used as needed throughout the year. The cost for conditioner is $90 and is billed once per year in June.